In late December and at the last minute, 10-year-old Cadence Colborn’s ringette team registered for the 2017 Ringette Scores on Cancer event in Edmonton. The event was taking place the last weekend in January at the West Edmonton Mall, which meant Cadence and her U12 Saskatoon Thunder teammates had just one month to fundraise. “I collected a whole pile of bottles and cans from families and friends, and I also called and emailed and texted,” says Cadence. Pretty soon, her efforts began to snowball. Cadence’s mom, Andrea Colborn, says that within several days, Cadence received help from friends, neighbours and a local business. She raised $2,353, making her the top individual fundraiser for the tournament. Cadence’s team raised $6,341.25, contributing to the weekend total of more than $60,000. 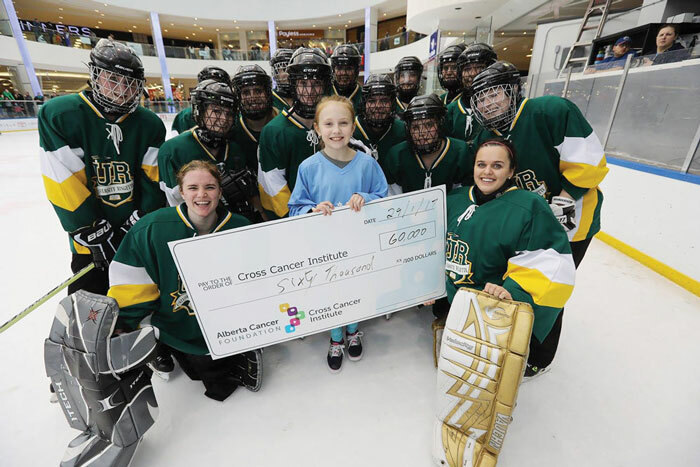 The tournament is a combined effort of the Ringette Scores on Cancer Foundation, the University of Alberta Ringette Team and the Alberta Cancer Foundation. Proceeds benefit the Alberta Cancer Foundation in support of the Cross Cancer Institute in Edmonton. Entering its ninth year, Ringette Scores has raised $700,000 to date. The tournament offers plenty of prizes for top fundraisers, but Cadence had another incentive. Her cousin, who lives in Alberta, was diagnosed at age 13 with synovial sarcoma, a rare form of soft tissue cancer. She is now 16 and cancer-free. Inspired by her cousin’s experience, Cadence says she wants to help find a cure and show other young people that they can help, too. Andrea says she was proud of, but not surprised by, her daughter’s determination.